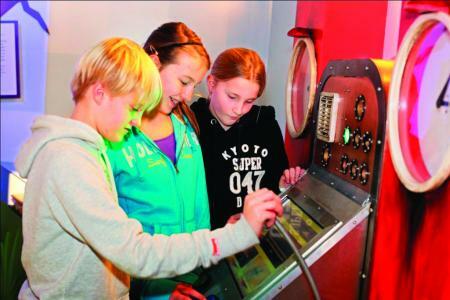 Make the most of family outings by choosing one of our parent-recommended museums. For fun, story-telling, literary inspiration and creative opportunities visit the Roald Dahl Museum and Story Centre. The pages of Roald Dahl’s best-loved books are brought to brilliant life in the Roald Dahl Museum and Story Centre, a light and bright hands-on space that all ages will enjoy. Dominique Dinse visited with Oliver, 10, and Ben, 8. So many kids know the writing of Roald Dahl, a visit to the museum devoted to him is like taking them on a playdate to a friend’s house. 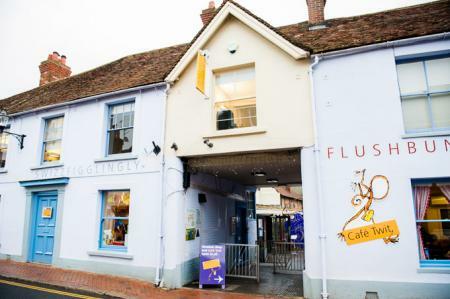 Nearly 100 years after his birth, the vibrant and colourful museum on the high street in his beloved Great Missenden where he lived and wrote for 36 years brings his stories to vivid life. The museum comprises three galleries – Boy, which covers his childhood and school; Solo, which shows how his real-life adventures inspired his writing; and the Story Centre, the museum’s creative hub with displays to inspire your own story-making. The museum has tons for tottlers. Storytelling sessions are held in a lovely light upstairs room, across the courtyard from the main galleries, with lots of dressing-up and acting-out. Also a huge hit with little ones is the fun height chart in the Solo gallery. A full-size picture of Roald Dahl measures a whizzpopping 6ft 6in – is your little one more like a Muggle-Whump? The much-loved Pelly? Or 1/10 of the BFG? There’s also loads of hands-on action – a mini flying costume to try on as you climb in to a life-sized cockpit in the Solo gallery – just like the one Roald flew in when he was in the air force. There’s more dressing-up fun in the Story Centre where you can step out as Fantastic Mr Fox, Mr or Mrs Twit; or try on some clothes from the delumptious dressing-up box to create your own crackling character. And if you fancy a sit-down, sneak to the Story Centre and pretend you’re Roald Dahl dreaming up another amazing adventure by sitting in his replica writing chair. Every child over five receives My Story Ideas Book, a clever writing and drawing notepad where they can scribble ideas as they explore. And dotted round the museum are free pamphlets to peruse and pick up. We loved “I’ll Be Roald Dahl” where you team up in pairs and take turns at being either the writer or the illustrator – remember how beautifully Quentin Blake’s pictures tell the stories dreamt up by Roald Dahl? Oli’s job as writer was to imagine a fish and describe it to Ben, the illustrator, who had to match the drawing as best they can – Oli had to think up imaginative clues and it turned into a brilliant game. The whole museum – and the Boy Gallery in particular – is full of intricate detail about Roald Dahl’s life and the experiences that turned him from a cheeky schoolboy into one of our best-loved authors. Years 3 to 6 kids should particularly enjoy The Gloriumptious Guide – a booklet of 40 things to discover and do in the museum that comes free with your entry ticket. On our visit the touch screen computer seemed to be especially intriguing to older explorers who are asked to read through to discover where the real Willy Wonka came from, and who was the original hero in The BFG. There was also plenty of sniggering at Roald’s rude and funny letters home – so full of irreverent detail about his friends and teachers from a very early age. There are fascinating spoken-word installations – especially Quentin Blake talking about how he and Roald Dahl worked together – and loads of pictures from his schooldays all the way through Dahl’s air force career to his family life as a grown-up. The intricately recreated writing hut Roald Dahl wrote in, painstakingly relocated here from his Buckinghamshire back garden, complete with all the minutiae he surrounded himself with as he wrote with his favourite pencil, the magnificently named yellow Dixon Ticonderoga, on yellow lined writing pads. See if you can spot the painting by his supermodel-turned-writer granddaughter Sophie aged just four, handmade birthday cards from other young relatives – and a giant ball of silver paper made up of rolled-up chocolate wrappers! Your entry ticket lets you come and go as you wish all day. Take advantage of this by grabbing two handy guides from the ticket office and setting out for either Roald Dahl’s Village Trail; or Roald Dahl’s Countryside Trail. If you’re there all day you can easily cover both. The first is a short local walk around the shops and sights of Great Missenden once frequented by the great writer, and ultimately to his shady grave in the Church of St Peter and St Paul, complete with giant BFG footprints. The latter takes visitors further afield, through the countryside Roald Dahl loved and which so inspired his writing. 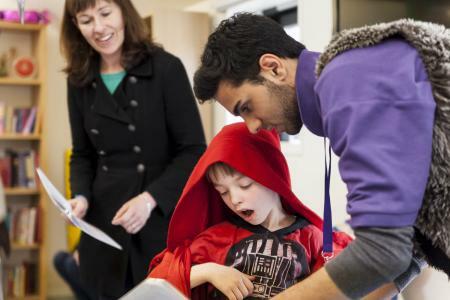 Before your visit, remember to book for that day’s workshop – well worth the small additional cost for a fun-filled session of Dahl-icious doings at weekends and in holiday time. 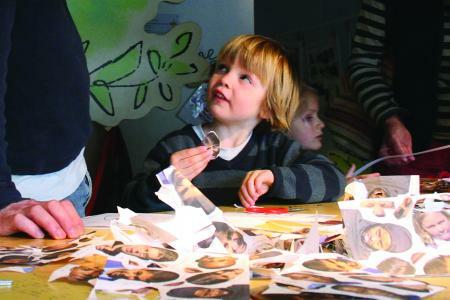 On our visit the whole family loved Mike Teevee’s workshop, with games, storytelling and craft activities for all ages. The splendiferously named Café Twit serves hungry visitors outside in the courtyard on sunny days, or in a cosy dining room. A thoughtfully put-together mealtime menu features jacket potatoes, panini, sandwiches and “today’s cauldron” – the homemade soup of the day. The Oompa-Loompa lunch bag is good value for hungry mini-visitors at £5.95 for a “sandwitch” plus yoghurt, raisins, fruit juice and crisps. For a naughty treat try the £2.50 Whizzpopper – swirls of foamy hot chocolate with marshmallows, Smarties and crushed Maltesers, all topped with raspberry coulis! By car: Driving through tree-lined winding country roads, spotting cows and horses in the fields, is a treat in itself. Great Missenden is just off the A413. From the M4, exit at Junction 8/9 onto the A404 towards High Wycombe. From the M40, exit at Junction 4 onto the A4128 towards High Wycombe. From the M25, exit at Junction 16 onto the M40 towards Oxford. A public pay-and-display car park is 5 minutes’ walk away – use HP16 9AE in your satnav. By train: Two trains per hour make the 45-minute trip from London Marylebone to Great Missenden. It’s a quick and easy walk from the station to the museum. By bus: Arriva Bus Company runs a regular bus service between Great Missenden and High Wycombe from Monday to Saturday. Buses 48 and 55 serve Great Missenden. Opening hours: Tuesday-Saturday 10am-5pm; Saturday and Sunday 11am-5pm. Closed Mondays. Last admission 4.30pm. Our boys deliberated over all the colourful bookends, cuddly cushions and dress-up sets – before settling on Roald Dahl Top Trumps for £4.99. There are also pencils, writing pads, rubbers and other Dahl-aphernalia to spark young writers’ imaginations. And, of course, all those best-loved books are on sale for around £5. Explore the three galleries from the comfort of your own writer’s armchair with a virtual museum tour. There are also writing tips from Roald Dahl if you fancy putting pen to paper yourself; and a host of cool recipes to help you cook up a storm in the kitchen like Willy Wonka – Whipple-Scrumptious Fudgemallow Delight, anyone? For teachers, there’s an invaluable selection of online lesson plans for literacy, drama, team-building and much more, based on all the favourite stories from Matilda to The BFG to Charlie and the Chocolate Factory.